Third-ranked Thomas Jefferson looks to extend its undefeated record this season against winless Uniontown in Friday’s WPIAL Triple-A Big 9 clash. The Jaguars dominated their competition again last Friday night, knocking off Albert Gallatin 48-0 in a game that was lopsided from the start. Running back Austin Kemp ran for over 100 yards and three touchdowns in the victory. The senior is currently leading the WPIAL in rushing and scoring, this after a junior year in which he surpassed the 1,100-yard mark. While Thomas Jefferson is living up to their hefty expectations to start the year by winning their first six games, Uniontown is at the other end of the Big 9 spectrum. Uniontown has yet to win a game this season, losing their first six outings. In their last time out, they were narrowly defeated 30-23 by Trinity. The Red Raiders will need more consistent play from quarterback Lyric Ellis, who is playing his first season at the position after being moved under center from the wide receiver spot. Uniontown’s coaching staff believes Ellis’s athleticism can give them a unique weapon on offense to catch other Big 9 conference teams off-guard. The Jaguars offense is obviously rush-oriented, as Kemp scored 28 touchdowns already this season, most of which he’s scored while running the Jaguars’ wildcat offense. For Uniontown to have any chance, they are going to have to contain the conference’s top rusher. Just two weeks ago, the likely conference player of the year scored 5 touchdowns against Trinity—a team that defeated the Red Raiders in their last game. The outlook does not look promising for Uniontown, as they will also have to contain Rick Daley, who scored five touchdowns against them in last’s season contest. 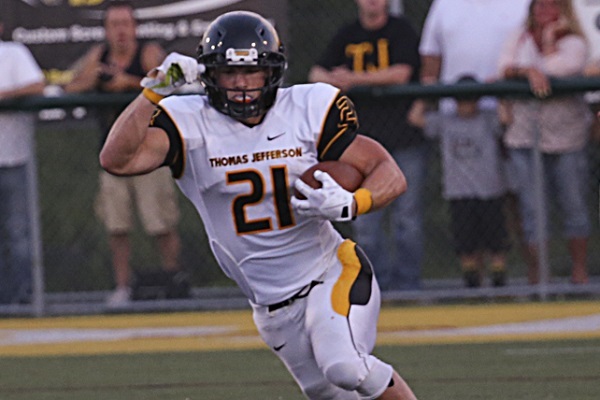 Thomas Jefferson entered the season expecting to use up to seven running backs. While Kemp has been the primary ball carrier, the Jaguars other backs have been more than willing to take the load off his shoulders when he needs a break. The Red Raiders will need to force the Jaguars to beat them through the air, which is easier said than done. Thomas Jefferson rarely strays away from its run game, and when things are going well, they’ll often use a multitude of backs. In their first game of the year the Jaguars ran the ball 52 out of their 53 total plays, demolishing Ringgold 49-6. It would be a moral victory for Uniontown if they could force the Jaguars to call over ten pass plays, a feat rarely achieved this season by a Thomas Jefferson opponent. The two teams will match up at 7:30 at Jaguar Stadium. Tonight’s game is the Pittsburgh Sports Report and US Steel Game of the Week. Students and fans, be sure to take plenty of pictures and Tweet them to @PghSportsReport #Jags. The best photos will appear online after the game! Click here for full season coverage of USS Game of the Week.